Life is a Yoga ? Many times, when we look at Yoga, we see it as a set of visually attractive postures, which has a photographic and cinematic element. The realm of visually attractive features makes yoga so attractive , to a newcomer, and so do different other forms of body related eastern spiritual practical practices – Martial Art , Tai chi , Reiki . But there is something more compelling and more interesting in Yoga , then in other forms of body related spiritual practices . Yoga is much more than Asanas , much more than pranayamas . It is a lifestyle, and more importantly, it’s a philosophy. It doesn’t stops there as Sri Aurobindo, put’s it a very concentrated phrase ‘All life is Yoga’. There is a Yoga , which is happening subconsciously within us as a natural process. 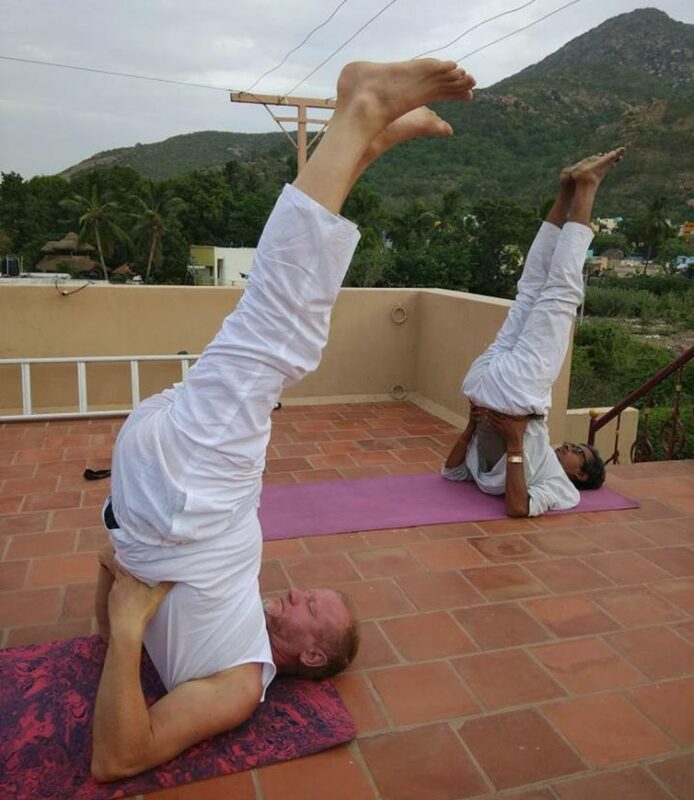 So , Yoga as defined by Maharishi Patanjali as “Chitta Vridhi Nirodha” is not just what is happening consciously only , when we perform certain form of asanas and pranyamas, backed by moral and spiritual code of conducts ( yama and niyama) which helps us to detach ourselves, from the nature (pratyahara) and dive inside to attain those exalted states and spheres of consciousness ( samana – dharana , dhayana and samadhi). But is also when we sleep after a busy working day , and when Mother nature lovingly takes away some vrittis, which gets stored in our mind , with the natural process of sleep . It indicates that the nature (prakiti), both in micro form (human) and macro form ( universe), is also practising a form of yoga , which helps her to get connected with its essence of her personality – which is purusha ( consciousness) . For an ordinary mind , steeped with everyday priorities , this kind of large scale yoga which is happening with Nature , doesn’t make a lot of sense . But what make sense to them, how these large scale natural process, existing from the time immoral creates value to his everyday life. How this is going to solve the back pain which he is suffering from 8 years , and cough which is not getting away. How is going to make him think better and how is going to help him to cope with a situation in life, which is creating extreme stress. In short, everybody wants an answer to a question on, ‘ how yoga would help him to keep well now , and to keep well in future ?”. Everyday , everyway we have one priority, which define all other everyday priorities . That is “Are we keeping well ? ” . The first question we ask to the other when we meet every time is “Are you well ? ”. Wellness is what defines our everyday life. From waking up in morning , to go for a walk , to take a breakfast , clean ourselves , get into job , work with the boss instruction , come back home , relax and spend time with family and go into bed , we want to be well, not only in the level of body , but also in the level of mind , in level of our emotions, and also in the level of our choices. Not only we want ourselves to be well , we want our families to be well , we want our offspring’s to be well , we want our state to be well , and we want the nation, to be well , we want also the earth to be well . The only persons, whom, we don’t want to be well, for different reasons, are our enemies. Except them, we want everybody in the world to be well. Yoga is a wonderful tool, to achieve that end, of making the world well. Many people can object on using the term “tool”, which makes yoga limited to again some technological process to meet some end. And they would prefer the word “blessing” . And I agree with it, after practising yoga for two decades , that, it is a blessing , which can bring wellness in its true sense, in our life . I am not a celebrity yoga teacher, and I don’t prefer to shot myself pictures on some celebrated yoga postures. Though I don’t mind, if somebody do takes some pictures, of the postures we practise in everyday life. Even our walking can be yoga, if you learn how to walk, keeping your spinal cord erect. Every thought can be also yoga, if you learn how to think, keeping your mind extremely concentrated, on the object of your thought. Every emotions can be also a yoga, if you know how to feel, attuned with the feeling of wholeness with the universe. 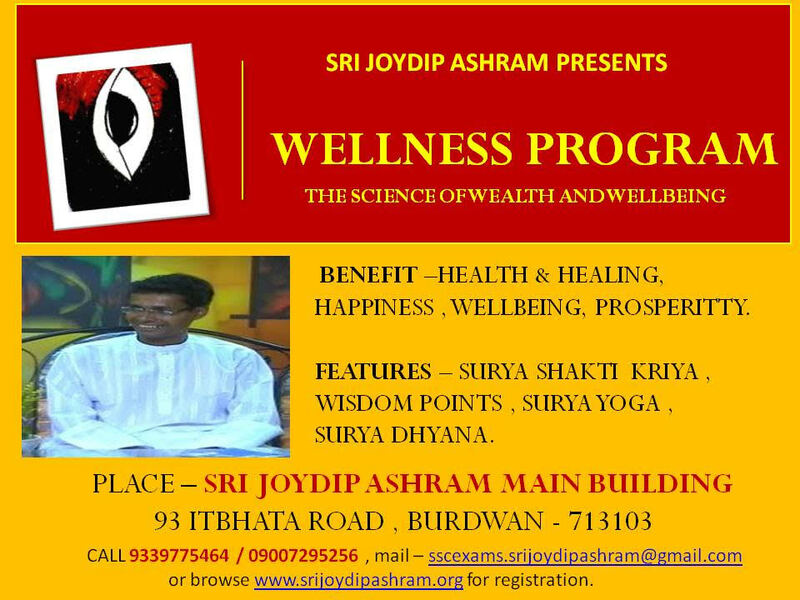 That is what Sri Joydip Ashram, teaches in its Wellness Program. Its not just a certain set of postures , and certain set of breathing exercise . It teaches you how to live a life of blessing using ‘Yoga’ in its full potential, and how to keep not only your body well , but how to keep also your mind well , how to keep also your emotions well , and finally how to keep your life well.